Santerre [later to become General] was appointed by the National Convention to serve as the jailer of the former king. 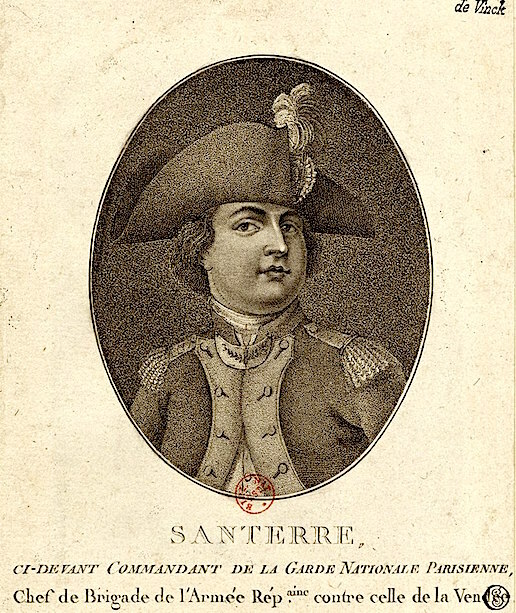 He notified Louis that the motion had passed for his execution, and the next day, at eight o'clock on a 21 January morning, Santerre arrived at the convicted man's room and said, "Monsieur, it's time to go". He escorted Louis XVI through the some eighty thousand armed men and countless citizens down the streets of Paris to the guillotine. There are differing accounts of his conduct at the execution itself. According to some, he ordered a drum roll halfway through the king's speech in order to drown out his voice. Others say that it was actually General J.F. Berruyer – the man in command of the execution – who ordered the drum roll, and that Santerre only relayed the order. Santerre's family maintained, however, that he actually silenced the drums so that Louis could speak to the people. The voice of the people, the voice of God, a pearl of wrongnessence, a divine ventriloquast and metaphisicalisticalflopish porkie, ink-pot and flower of highway robbery. Or shall we say: at the beginning there was the babble, followed by the precursorial grunts of the great gibberishmish. This is a point of view. Of all means, when this voice is gabbledjabbled by the gross machination of the vote, it’s only to hail Caesar at lunchtime, to hang him by supper, to lament his death till breakfast and have banquets in between. This is not serious at all and would indicate that God has no plan or that he is an amusing trickster to make us swallow bulldust. As far as our century goes, we already have some totalitarian democracies and those democracies dedicated to God are very dubious. Should God be in favour of a Republic, he is regularly defeated by the voice we think he has, and smart-arse spirits start to suspect that the true democracy, that which no-one understands but everyone talks about, should desist from the Universal suffrage that tends to regularly play nasty tricks upon us. We need to relate to some Amerikan scientists' ideas who wish to stop research on the atomic bombs that they think has a funeralist career. If, like we keep repeating ceaselessly, science and democracy walk together triumphantly towards progress like two enchained prisoners, one will have to expect the birth, in the conscience of great democracies, of the same doubt gnawing at the soul of these anti-bomb scientists. Technology and sociology having made a pact, the nuclear Armageddon illuminates the perspective of a lost social future. This flickering equation has thus been inspired by the latest revelation about the esoterismic druidistic beliefs. Translation (and adaptation) by Jules Letambour.